I have a picture and a story to share with you this Valentine’s day. My cousin’s wife asked if I could make her an anatomically correct, human heart. She has a friend that is going in for a heart transplant this spring. She has gone through quite a bit to get to this point. 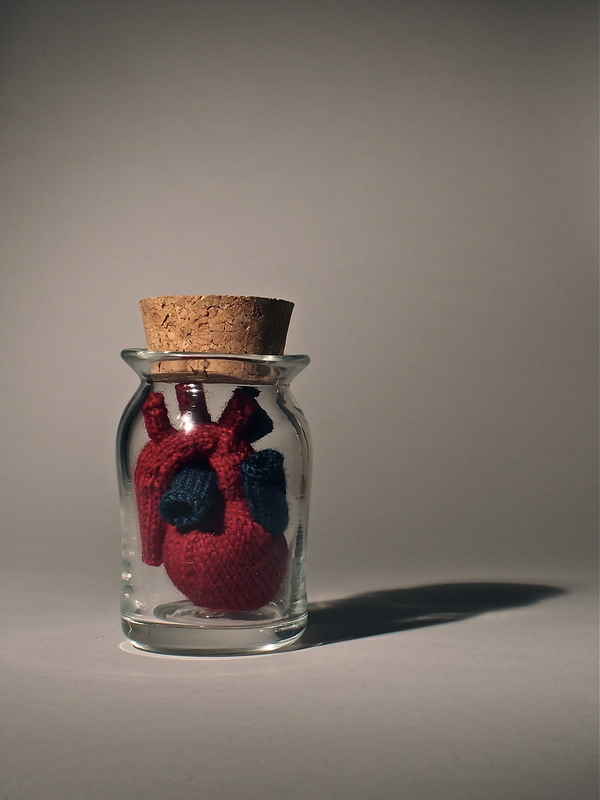 In a meeting with her surgeon she asked if she could keep her old heart. I would imagine that having your heart removed, would carry with it a sentimental emotion. As with Valentine’s day we attach meaning to a heart. We connect it with love caring and feeling. It is a symbol of how we feel, whole or broken. When something is heart-felt people will put their hands on their heart, we cross our heart when we make a promise, we cover our heart when we make a pledge. The surgeon told her that she would not be able to keep her heart after the surgery. When she told my cousin’s wife about this it made her sad to hear. It wasn’t about her keeping a real human heart but what her heart meant to her. So this is where this picture comes from. I was asked if I would try to knit her a replacement. It took a while to make, thinking over how to create the shape, how to make and attach the ventricles and aorta before I started trying it out. I finally finished it just last month and though I would share the final piece and the story before I send it off to it’s new owner. Any day is a good day to do something heart-felt for someone. I hope that everyone has a wonderful Valentine’s day. What is something heart-felt that someone has done for you?